Nevermind the music in the video above, which you can take or leave. (We’ll leave it, thank you very much.) Pay attention instead to what the band We Are the Ocean is doing in the clip: Rewarding superfans for checking in early to a show by letting them watch the soundcheck. Loyalty programs for music fans is a neat idea, and we’re surprised we’re not hearing about more bands doing similar stuff. This particular offer came from Flowd, a social network for music fans. Setting up a new social network might seem like a crazy thing to do when everyone’s already on general-purpose networks like Facebook and Twitter. But Flowd offers bands more than those do: It gives them the chance to build customized offers for their fans using a simple, web-based wizard that even the drummer can figure out, to offer complex “Offers” redeemable via mobile coupon on a smartphone (iPhone, Android or old-school, pre-Windows Phone 7 Nokia). Last year, executives at Digia (Flowd’s parent company) decided that Foursquare (location sharing), Groupon (group offers) and the fact that more recording artists were “actively using social media to engage with fans,” in the marketing words of Flowd director of marketing Willhelm Taht, meant an opportunity existed to build something that combined all of these things, and also integrated with Facebook, Twitter and soon Tumblr. What about those other social networks? “This is the only social media client that puts the artist in the center,” he said. “As an artist, you are able to incentivize your fans to do things, and reward them accordingly,” explained Taht. “The simplest thing to do is say, ‘Follow me in Flowd and you will get XYZ.’” More interestingly, artists can make more elaborate Offers within Flowd using a web app that lets them set all sorts of parameters for each Offer (randomizing it among qualifying fans, making it first-come-first-serve, tweaking how the mobile coupons are redeemed, and so on). Taht told us about two prominent hip-hop artists who plan to use this soon, but advised us not to publicize their names, possibly because the details haven’t firmed up. 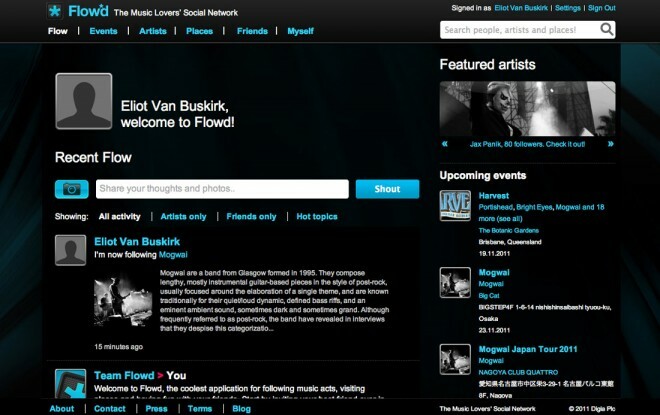 To be sure, Flowd needs some big names using it in America (so far, its biggest star is trance DJ Armen van Buuren), because without that, music fans are hard-pressed to join another social network (you do have the option to join with your Facebook login). Airlines, train companies, coffee shops, and seemingly everything else has a loyalty program, so why not bands? This idea might not be as crazy as it sounds.